This exhibition features a group of recently rediscovered large-scale works by Charles Ephraim Burchfield (1893-1967) that represent the most ambitious direction he ever took in painting. The majority of these watercolor works are composite constructions in which Burchfield collaged earlier paintings or parts of paintings into much larger, more ambitious compositions. Literally patching his past into his present, Burchfield reoriented the original nucleus into extended surrounds of additional strips of paper on which his painted and drawn elements significantly expand his original conception. Burchfield’s composite works provide profound insight into what was for him a continual effort to confront and realize his own evolving artistic future. This exhibition will travel to the Burchfield-Penney Art Center in Buffalo, New York from July 13 to September 23, 2007. A catalogue is available with an essay by Nancy Weekly, Head of Collections and the Charles Cary Rumsey Curator of the Burchfield-Penney Art Center. Burchfield had begun creating composite paintings as early as 1943, when while contemplating two watercolors in his studio, the almost complete Two Ravines and a 1917 watercolor of the same subject that he had reworked in both 1919 and 1931, Burchfield experienced a breakthrough which would strongly influence his working method in the coming years. On an impulse, Burchfield decided to complete the 1917 watercolor by enlarging it with strips of additional paper and repainting it "completely in the 1917 manner." The resulting painting, titled The Coming of Spring, is considered a pivotal work in Burchfield's career and is now in the collection of The Metropolitan Museum of Art in New York City. Blue Dome of June, 1955-1963 started as an ode to summer in June Clouds, a watercolor signed and dated in 1955. The horizontal painting, measuring 29 by 38 inches, depicts masses of fluffy, cumulus clouds over a field of flowers and grasses framed by two opulent trees. 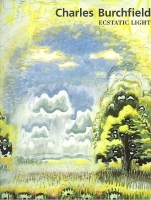 In June 1963, however, Burchfield wrote: “Today while studying the “June Clouds” I suddenly saw the cobalt sky behind and above the clouds develop (in my inner eye) into a beautiful blue dome, with a huge cloud above it, from behind which golden yellow light poured downward on the earth below.” Totally transforming the composition into a tall, vertical format measuring 60 by 50 inches, he suggested infinite space imagined as a light rimmed dome of azure sky. Thunderheads were the subject of a number of Burchfield works during the early 1960s. Sunburst in October, 1960 shows, in its upper half, an image painted in watercolor of the sun struggling to emerge from behind a massive thunderhead. The lower half of the image is a charcoal drawing of a vast rocky landscape. For him, the panoramic view became necessary to express the powerfully transcendental qualities of nature in the primeval American landscape. From our post-modern perspective, we appreciate the emerging painting's beauty and symbolism. In Dawn of Spring the outlines of the earlier watercolor can clearly be seen—several extremely mystical trees in a rolling landscape lit by a semi-circular sun. Instead of the total transformation of the earlier work often seen in Burchfield’s collaged constructions, here he has subtly expanded his original conception through the addition of narrow extensions to all four sides of the image. Further evidence of Burchfield’s thought process can be seen in the form of notes written in charcoal at several places around the image. Winter Sunburst reveals Burchfield’s unorthodox methods for painting in watercolor. Inspired by a flash of blinding white sunlight nearly eclipsed by the roof of a house, he scrubbed away portions of a tree at the right so he might direct the focal point to the light phenomenon. In its current state, the snowy landscape is total engaging, with a haunting, ghost-like mystery reminiscent of 19th-century spirit photographs. Charles E. Burchfield has been the focus of a number of museum exhibitions over the years, including an exhibition of early watercolors at the Museum of Modern Art in 1930, and retrospectives during his lifetime at the then-named Albright Art Gallery in Buffalo in 1944 (that was circulated by the American Federation of Arts in 1945), the Whitney Museum of Art in 1956 (that went on national tour to 6 venues through 1957), and the University of Arizona Art Gallery, Tucson in 1965. On December 9, 1966, the artist celebrated the inauguration of the Charles Burchfield Center at Buffalo State College. The museum, now called the Burchfield-Penney Art Center, has become his primary study center with the world’s most comprehensive collection of his art and archives. Since his death in 1967, major exhibitions have included two exhibitions at the Metropolitan Museum of Art in 1984 and 1990, two traveling exhibitions organized by the Columbus Museum of Art in Ohio, and two exhibitions organized by the Burchfield-Penney Art Center that have toured nationally. Burchfield’s work is represented in virtually every major public collection of American art in this country.